Think, for a moment, of your customer as a patient in the doctor’s waiting room. I do a lot of my work in the pharmaceutical arena, and one of the many areas in which pharma sales reps are trained is helping to identify, with the doctor, exactly which patients are appropriate for the treatment to be prescribed. You have to know the pain, to prescribe the relief. We’ve been walking through 20 Clarity Questions* that every company should answer in order to set a clear business focus and direction, and one of those key issues has to do with pain relief. 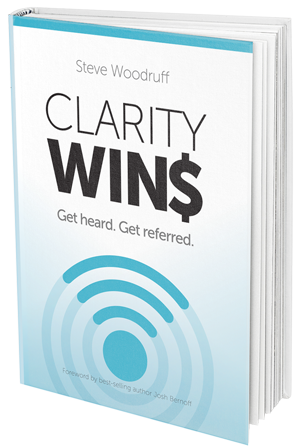 Clarity Question #8 – What is Your Customer’s Pain? Why do you need to clearly understand your customer’s pain? Simple – it is directly connected to their wallet. People pay for pain relief. Therefore, that’s what you need to market. How you relieve (or prevent) pain. You’re not selling insurance, or financial planning services, or identity theft protection. You’re selling peace of mind. You’re taking a distracting and fear-full weight off my shoulders, so I can get on with other things. Some of my training development partners sell compliance training programs. You know what they’re really selling? Fear-of-loss protection. Who wants to get a multi-million dollar fine from a federal agency because they can’t demonstrate that employees were properly trained? That’s called prophylactic pain relief. Another reason why it is vital to clearly articulate your customer/marketplace pain is that you want to target your efforts primarily toward those who feel a need for your product or service. Where would you best set up a point-of-sale kiosk for sun protection products – Seattle, or Miami Beach? Would you use Snapchat to market incontinence products? Just so – aim your precious marketing and sales dollars at those who already know they need what you offer. Here’s your marketing homework assignment. Get a piece of paper and draw a line down the middle. On the right side, scribble down all the sweet, juicy, technical details describing the wonders of what you offer. Line up all your bullet points. Then, write underneath that: NOBODY CARES (unless I’m fixing something). After that, on the left side, come up with a single sentence – no commas allowed – that describes the main problem you’re fixing. The pain you’re relieving. Sell that. Because that’s what your customer is buying.